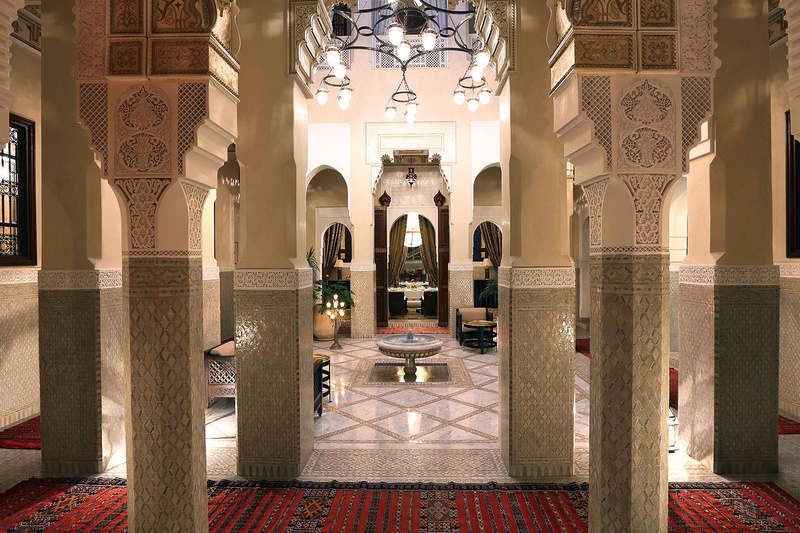 Like the great gates of the imperial cities of Morocco, the monumental entrance to Royal Mansour is testimony of the local craftsmanship as well as the materials and techniques used; such as the traditional cedar wood, chiseled metal and sculpted plaster work. Commissioned by King Mohammed VI, traditional Moroccan architecture, design and opulent craftsmanship are proudly, and lovingly displayed. 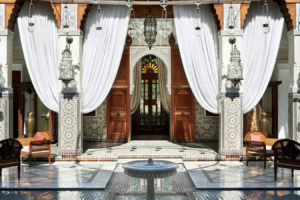 From the trickling hypnotic water features, grand geometric mosaics and flickering chandeliers that dress the courtyard hub, to enchanting candle-lit rose and lavender-clad medina walkways and palatial riads – wherever you glance there’s a vision of beauty. 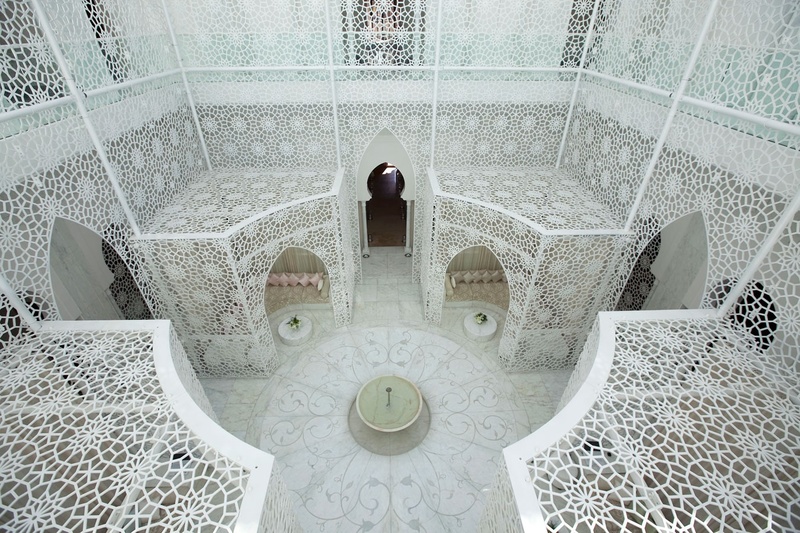 Spanning three floors, with a heavenly light infused intricate white trellised atrium, the spa is a palace in its own right – elegant and serene with scattered calming water features. 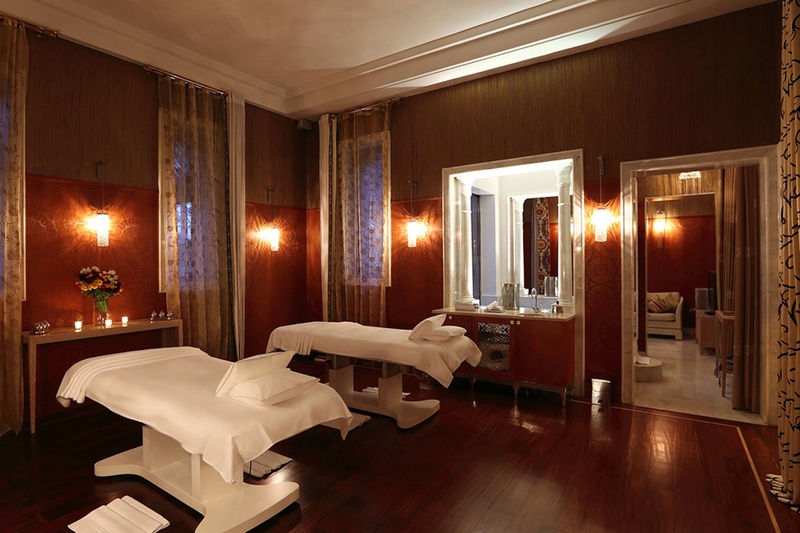 Facilities include a state of the art Hammam suite, swimming pool, a spa shop and café and individual relaxation pods. 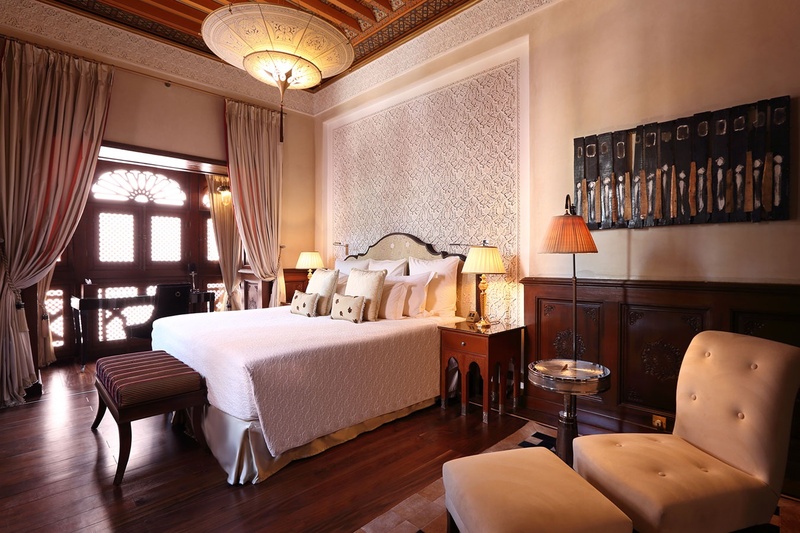 53 individually designed Riads each span three floors and comprise of one to four bedrooms. Rooms are arranged around a central open-air courtyard with all ground floors featuring a living room, bar, lobby and an outdoor patio. 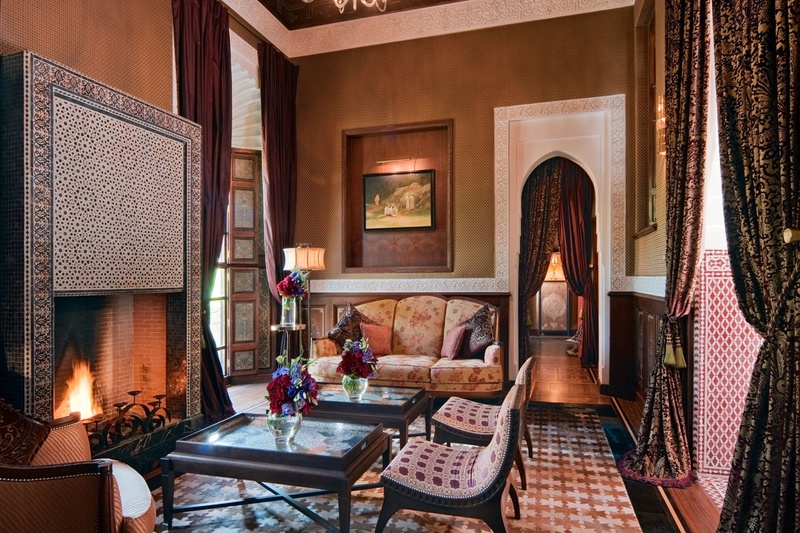 Larger riads also boast galleries and dining rooms. Features include private roof terraces with plunge pools, open fires, private hammams and Bedouin tented areas. 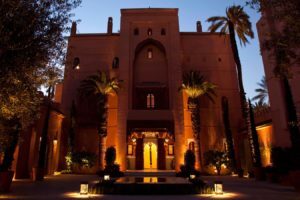 Renowned and celebrated as one of Morocco’s best eateries Yannick Alléno – a three Michelin star Parisian chef – heads up the Grande Table Marocaine where he and his team create an array of gastronomical delights. Head to La Table for breakfasts fit for a king, and La Table Franciase for French gourmet cuisine. 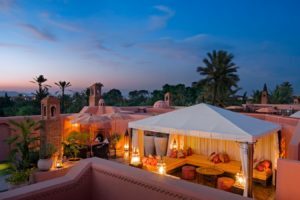 Hidden in a secret oasis behind the ancient city walls – amongst palms, citrus, olive and pomegranate trees – the tranquility of The Royal Mansour feels a million miles away from the vociferous bustle of nearby Djemaa el Fna square. 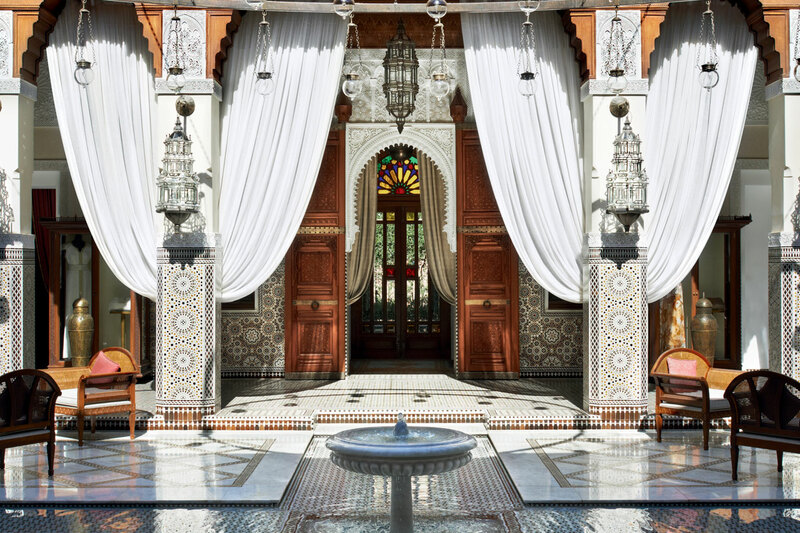 Commissioned and owned by King Mohammed VI, traditional Moroccan architecture, design and opulent craftsmanship are proudly, and lovingly displayed. 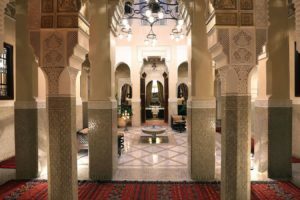 From the trickling hypnotic water features, grand geometric mosaics and flickering chandeliers that dress the courtyard hub, to enchanting candle-lit rose and lavender clad medina walkways and palatial riads – wherever you glance there’s a vision of beauty. 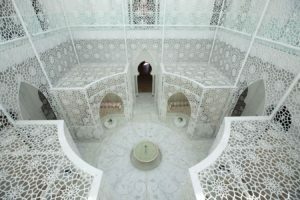 Spanning three floors, with a heavenly light infused intricate white trellised atrium, the spa is a palace in its own right – elegant and serene with scattered calming water features – facilities include a state of the art Hammam suite, swimming pool, a spa shop and café and individual relaxation pods. 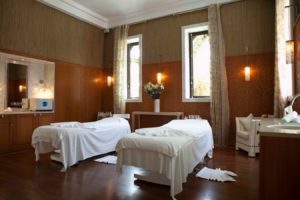 Throughout the year global wellbeing experts and therapists (including reflexologists, nutritionists and physiotherapists) gather at the spa for special ‘Wellness Weeks’ where they perform seminars and one on one therapies with guests. Wellness Week ‘experience packages’ include: Invigorating, Purifying or Regenerating – which include a selection of therapies to complement each experience. All guests are welcome to attend the complimentary seminars which include ‘How to Let Go Throughout the Body’ and ‘Facial Reflexology’. 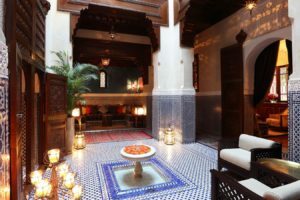 Moroccan Deep Tissue Massage – My tailor-made massage began with a consultation to discuss any areas of concern, then a relaxing foot ritual, followed by three deep lavender inhalations. Assisted stretching exercises helped to loosen my limbs and relax my back. 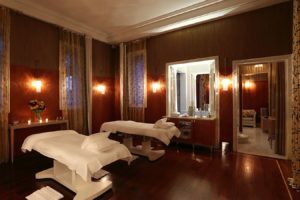 What followed was one of THE BEST massages I’ve ever experienced – using magical kneading and pressure point techniques, the therapist managed to work away tension in my scapula that had been there for years – I didn’t want it to end! A relaxing hand, head and scalp completed the more-ish treatment. 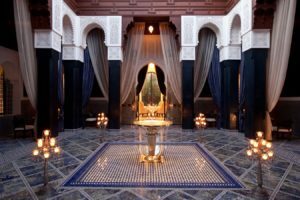 Traditional hammam, reflexology, Maroc Pureness Facial, balneotherapy, sea algae wrap, Sisley Hydration Facial and therapeutic massage. We stayed in a One Bedroom Riad. Towering 3 floors, a palatial pad literally fit for a king, with a stunning interior of bespoke handcrafted furniture, sumptuous silks, colourful mosaics, a rooftop plunge pool and indoor and outdoor open log fires. 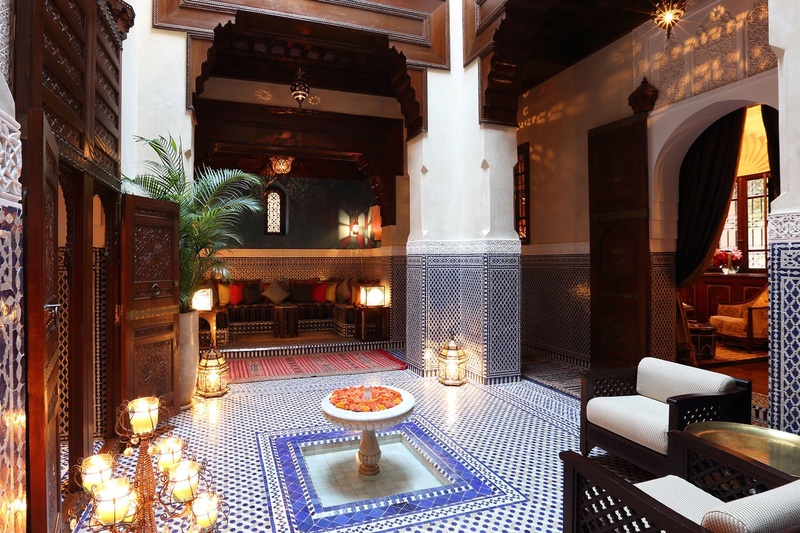 A cool courtyard atrium, kitchenette, living and dining area sit on the ground floor with a winding stone staircase leading to the bedroom and bathroom with a walk-in monsoon shower and marble Moroccan bath. A sunny roof terrace sits above. 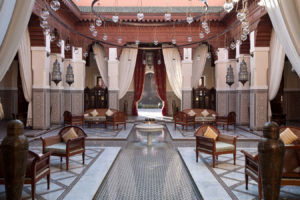 Facilities in all riads include Nespresso, mini-bar and butler service. 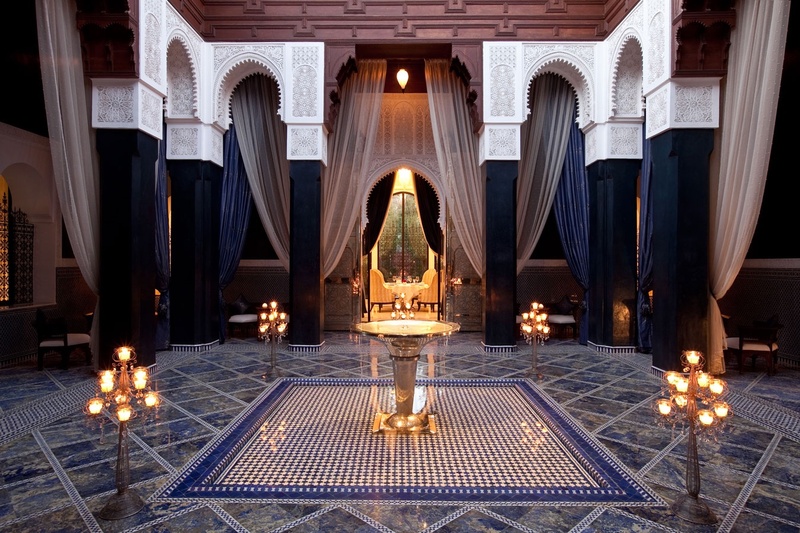 Everything feels majestic at Royal Mansour and the restaurants are no exception. 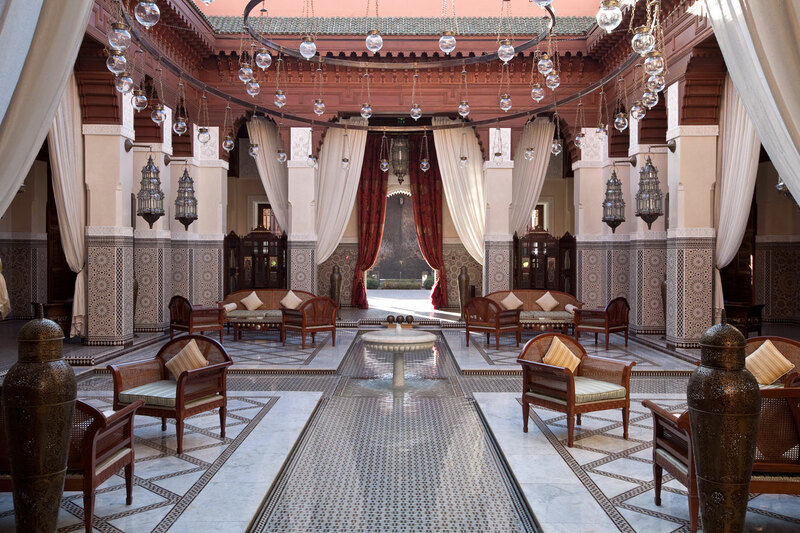 The decor at Grande Table Marocaine is opulent and sophisticated, the ambience sublime and the service impeccable. Renowned and celebrated as one of Morocco’s best eateries Yannick Alléno (a three Michelin star Parisian chef) and he’s team create an array of gastronomical delights such as poached spiny lobster, with beetroot and citrus, as well as classic briouates and tanginess. Head to La Table for breakfasts fit for a king, and La Table Franciase for French gourmet cuisine. Be sure to check out Le Bar – a stunning pink gold leaf adorned cocktail bar and lounge. A stroll to the nearby ‘must see in Marrakech” Djemaa el Fna square. Nightime lounging on the roof terrace by the roaring log fire, listening to the The Muezzins melodious call to Prayer.